We are a leading Manufacturer of three chain conveyor, packing belt conveyor, belt conveyor, inspection belt conveyor, pvc flat belt conveyor and gravity roller conveyor from Ahmedabad, India. 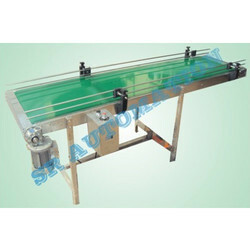 We are manufacturers of Three Chain Conveyor in Ahmedabad, Gujarat. We provide services in Food, Beverages industries, Pharma industries, etc. We are a noteworthy manufacturer of a comprehensive range of Packing Belt Conveyor. This conveyor is precisely manufactured by our highly skilled professionals, using high-grade components and latest technology in compliance with international quality standards. To ensure the quality and durability, this conveyor is stringently tested against various set industry parameters. 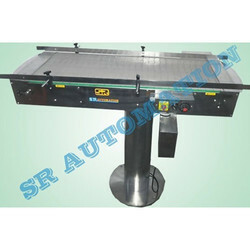 Moreover, our valuable clients can avail this conveyor at most affordable price. Automobile Spares/ Oil / Lubricant Manufacturers. We are a noteworthy manufacturer of a comprehensive range of Belt Conveyor. This conveyor is precisely manufactured by our highly skilled professionals, using high-grade components and latest technology in compliance with international quality standards. 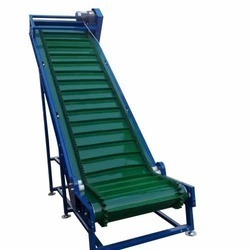 To ensure the quality and durability, this conveyor is stringently tested against various set industry parameters. 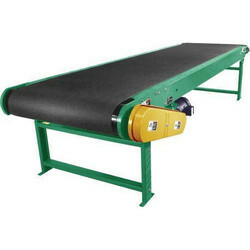 Moreover, our valuable clients can avail this conveyor at most affordable price. We have marked a distinct position in the market by offering superior quality Inspection Belt Conveyor. Used to elevate bulk packed products, offered conveyor belt is manufactured using the best quality components and modern technology in sync with industry standards. Our provided conveyor belt is available in different shapes and sizes in accordance with the demands of our customers. Being client centric firm, we stringently check this conveyor belt to ensure its flawlessness. We are providing PVC Flat Belt Conveyor to our clients in Ahmedabad, Gujarat. We are engaged in offering Gravity Roller Conveyor for the safe and virtually maintenance-free handling of goods for diverse application requirements. Renowned for rigid construction and apt conveying ability, these conveyors find wide application in warehousing, production lines, accumulation at the arestart or end of powered conveyors & manual assembly lines. To meet client requirement we also offer 90-degree bend gravity roller conveyor. 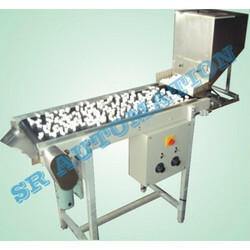 Slat Chain Conveyor Systems are used for general assembly production. The systems require no lubrication and very low maintenance. Slats are connected on two standards of a chain by attachments. The construction is such that any slat can be removed easily. 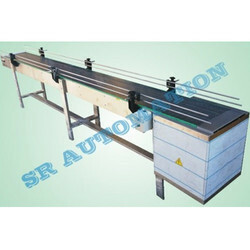 Fixtures can be mounted on the Slat for application such as assembly line conveyor. For inclined applications. Slat chain conveys is widely used in all types of industries due to the modularity offered by its construction. 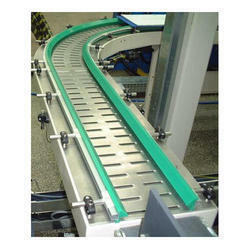 Slat Chain Conveyor available in any SS / DELRIN make the center moving belt. The system can also be supplied with Variable Drive Speed System. Angle Belt Conveyor can be used to elevate bulk packed products. The top surface of this belt is brought, which holds the material for the inclined application. We are manufacturer of PU Belt Conveyor in Ahmedabad, Gujarat. The Swing Conveyor transfer of various types of vials, bottles, jars or any product for powder filling or liquid filling line. Swing Conveyor suitable for online operation/transfer of any products from one area to another or from one machine to another. 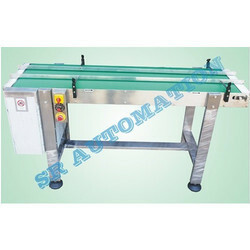 Swing Conveyor can also be used to adjust the packing area length with other machines. We also have swing conveyor system for use mainly in pharmaceutical industries. 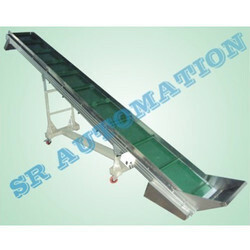 Swing conveyor is suitable for easy movement of material or operator. Swing conveyor can be open like the door for easy movement without disturbing the setup of the complete line. 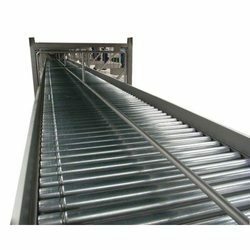 Swing Conveyor available in various length as well as the width of 85mm, 90mm, 100mm, 125mm in stainless steel slat or plastic slat belt depending on the type of products. The conveyor system is available in various speed ranges with the option of fixed speed or variable speed drive system using A. C. Variable frequency drive system. We can also design and supply conveyor as per the customer's customized requirement for use on any packing line in pharmaceuticals, food, chemical, pesticide or other industries.